Batch file rename – a wonderful drug that everyone wishes to have when you have to rename multiple files at a time. 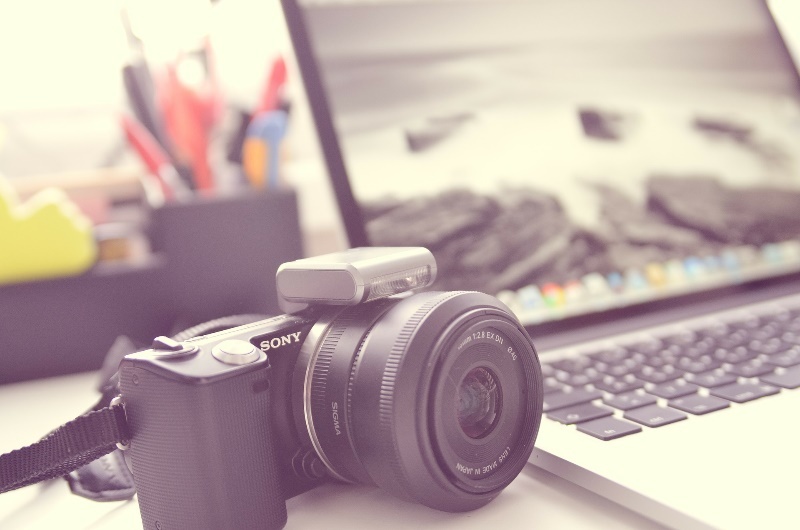 I guess a lot of us have faced with monotonous, tedious, but necessary work as renaming of photos and there is no wonder that to ease this work a lot of batch rename files Mac solutions, as well as solutions for other operating systems, appear on the market. So how to rename a file on Mac with absolutely no effort and within a couple of minutes? From this article, you will learn how to rename files in bulk as well as some of the reasons for batch renaming. As we all know, sometimes there are situations when you need to rename a large number of photos, as you may get them from various sources. For example, when using different digital cameras, the names of the photos have different attributes and are unattractive, something like DSC01479.JPG. They are difficult to pronounce, and even more, they do not carry any useful information. After a certain amount of time passes by and the number of photos became more and more, it could be difficult to find the file that is of a great interest to you. However, if you use batch image rename tool, you can simplify the later search for the files and make the files more informative. For example, instead of names like DSC01.JPG ... DSC999999.JPG there will be a group of files with names, for example, Christmas01 ... Christmas999999. Perhaps, you have ever wondered how many years your child was on that or other photos or in which year exactly did you have such a wonderful New Year tree with such fluffy branches? When you shoot a photo, it seems to you that this moment will be remembered forever. But alas! Unfortunately, we can forget not only the exact date but also the year of the taken picture too soon. Of course, the date and time of creation are always kept in the information about the file, but when you have to sort multiple pictures into different folders, the process of finding out the date this way requires a lot of time, that unfortunately, not a lot of us have. Would not it be more convenient to indicate the date in the name of a file? Thus, you will never need to check whether the actual date of the photo was changed when copying files to the computer or any other operations. What is meant under the term batch file rename? Under the term batch renaming of files (photos), it is meant the replacement of the original name of the file by the desired one based on some principle. The process of batch renaming is usually done automatically. As a rule, the new name is usually consists of a common name (part) and an individual item (part) for every image in bulk. For instance, Sea001, Sea002, Sea003, etc. As you can see from this example, the common part is SEA and the individual part is the file sequence number. For instance, when you were on a long holiday abroad and upon the arrival home you have gathered all the photos from people you have been with as well as from all your devices. So when you have done this, you can see a lot of files with absolutely no meaning. It is no wonder that you want to make an order with the files instead of having a lot of folders with some sort of letters and numbers. As we have said earlier, the names that are assigned to the camera images when shooting are totally uninformative. That is why it is completely impossible to guess which picture is hidden, for example, under the name DSC02799.jpg. Therefore, when copying photos from a camera to a photo archive on a hard disk or somewhere else, they are usually renamed, giving descriptive names, telling about when and where the photo was taken, what event is displayed on it, and so on and so forth. It is useful, for example, to specify the date (possibly only year and month) in the name of the photo or the number of the frame, for example, 2011-09-05_0015.jpg or 2011-09_0015.jpg where 15 is the number of the frame, shot on September 5, 2011 or in September 2011). It is also possible to add the name of a place or an event to the name of the photo. The variant of the name of a particular photo from the group, in this case, can look something like Trolltunga_2011-09_0015.jpg. The unique names of your photos can help you to identify your images, as they allow you to differ every single photo from each other. In case, if you are not using unique names sooner or later you will face the issue that the names of the photos would be duplicated when moving images from one folder to another or from one drive to another. For instance, you had the photos take on the 4th of July. Your camera creates the names for the files DSC01479.jpg, DSC01480.jpg, DSC01481.jpg, DSC01482.jpg. The same day you move the taken photos to your hard drive and erase the card of the camera and go for another shooting. Once again, your camera creates the names for the files according to the same structure DSC01479.jpg, DSC01480.jpg, DSC01481.jpg, DSC01482.jpg. I think there is no need to explain what will happen when you try to copy these photos to your hard drive….two files with the same name, but with different content. You can imagine all the mess. One more variant when renaming can be rather handy is if you are a photographer. As we all know photographers edit photos a lot and even one photo can be edit thousands time. So adding sequential number can be of a great help here, as with its help it is easier to track the versions of images and to keep the history of editing. Renaming in bulk is also considered to be the second important process when creating a proper digital archive. This can help in searching your files within a couple of clicks and minutes. Generally, in order to rename photo Mac users specify the file name mask in a general view. Usually, English alphabet letters, numbers, underline character, the year and month of the shooting, the serial number, and other characters can be used in such a mask (please note that symbols in different utilities may differ). With the great variety of batch image rename solutions on the market, it’s sometimes can be rather difficult to choose the one and only. The main differences between them are the ways they rename your photos and the set of additional features they offer. Perhaps you have used some of them and now are in a search for a better file rename solution as you want more advanced app or perhaps you have just only at the beginning of your search. Nevertheless, in this article, we will answer the question “How to mass rename files” so if you needed to rename, a large number of photos, but your hands did not reach it before, maybe now is the time. Renaming of a file is one of those simple things that are so obvious and so simple but sometimes can be a real pain if doing things manually, especially if you are dealing with a big number of images every day. However, batch rename Mac utilities can help you a lot, as they facilitate this process and give you a bit more free time that you can spend with your family, friends or beloved people. 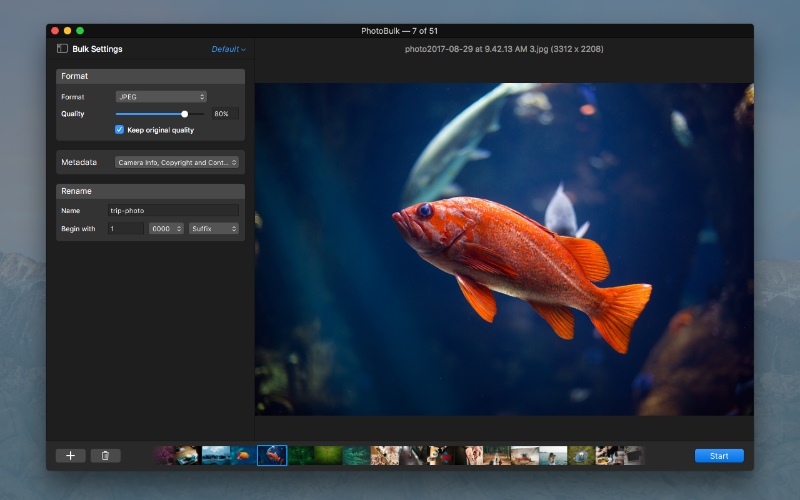 PhotoBulk is exactly such kind of a solution that makes difficult things easy. The app is very simple to use and doesn't require a lot of learning. Having a rather intuitive interface you will be able to master your skills in photo editing within a couple of minutes. 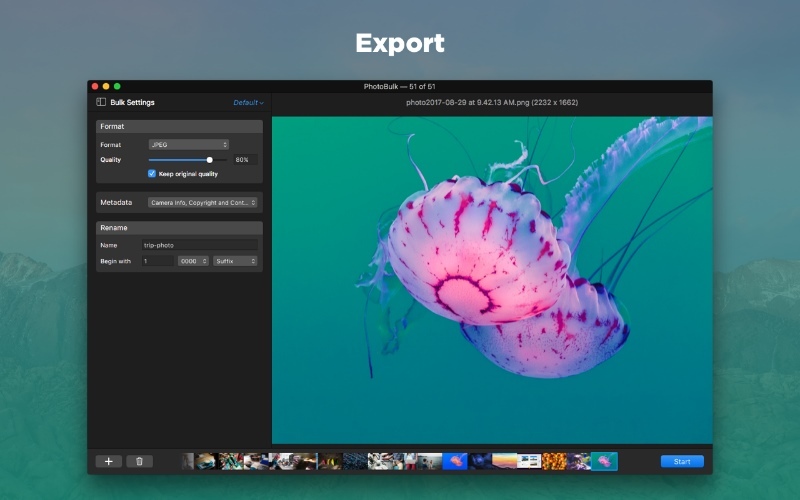 The current version of the app can boast about a stylish dark interface with a big preview window thanks to which you can track all the editing manipulations in real time and see the end result before clicking the Start button. Another important thing is that while using PhotoBulk you do not need to worry that it can somehow affect your original photos, as the app saves the proceeded photos as individual files. The “Name” option. You can choose any name you wish and type it into the corresponding field. Nevertheless, do not forget that there is a limit to 230 characters for the name of the file. So in case, if you wanted the new filename to include more than 230 characters, it will not work. The “Begin with” option. Specify the starting number by typing it to the corresponding field. The name sequence can start from 0 and end with 9999. “Choose the number format” option allows you to select how many digits there will be in the number. However, do not forget that the number will have just as many digits as there are zeros in the format. The “Prefix/Suffix” option. Specify whether you want the number to be placed before or after the file name. • You can download the app by following the link here. • Or you can download the app from the Mac App Store. After choosing the downloading variant convenient for you, continue with the installation of the app. Once everything is installed, it is the time to launch the app. Locate the photos you want to rename and import them to the PhotoBulk. You can import the files in several ways, including drag and drop option, the + button at the bottom left or go to File > Open or hit keyboard shortcut ⌘-O. After the photos being imported, you can see all of them in the filmstrip at the bottom. To start renaming the chosen photos you need to, first of all, activate the Rename option in the sidebar by putting a tick into the corresponding checkbox. When the option is activated you will see the setting box to the right of the Rename option. Type the desired name, choose between prefix or suffix position as well as start number and the number of zeros to be included into the new name of the file. If it is needed, proceed with editing photos according to your requirements. Once everything is specified and you are ready to apply your settings, click the Start button. In the invoked window specify the path where you want your output photos to be saved. And that’s all. So, if you got tired of unrecognizable file names and of spending times searching for the photos in your photo archives then with PhotoBulk you can forget about all these things. Besides renaming, the app offers other useful features as resizing, converting, watermarking, and optimizing. By the way, the latest is done without losing the quality of the photos. Check this rename Mac solution and enjoy its hassle free work. Copyright © 2019 Electronic Team, Inc. and its affiliates and licensors. All rights are expressly reserved. The software programs and accompanying documentation are the copyrighted property of their respective owners and protected by copyright laws and international intellectual property treaties. PhotoBulk ® and all related product and service names, design marks and slogans are the trademarks and/or registered trademarks of Electronic Team, Inc. and its affiliates and/or its licensors. All other product and service marks contained herein are the trademarks of their respective owners. Any use of Electronic Team, Inc.’s and/or its affiliates’ or third parties’ trademarks or logos without the prior written consent of their respective owners is strictly prohibited.